What would happen if everything you owned in a particular room decided to catch fire at exactly the same moment? The room would virtually explode in flames and incredible skin scorching heat. Heat so intense firefighters often talk about having to bury their head in the carpet in an attempt to escape this localized version of hell. The effect is known as a flashover and is the closest an individual can come to spontaneous combustion and still, hopefully, survive. To protect firefighters and other emergency response personnel from this and other facts of life on the frontline, you need the very best specialized needle trade products available. Welcome to Cansew's Special Operations Group, where we are dedicated to ensuring you get the support you need to help your end-users protect and serve. 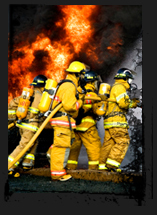 Learn more about our Kevlar®, Nomex® and other specialty products. Nomex® and Kevlar® are registered trademarks of E.I. duPont de Nemours and Company.